Why won't Remmina connect to Windows 7 Remote Desktop? I'm using Ubuntu and I'm trying to connect to another machine in a different network using remote desktop. I've opened "Windows Firewall with Advanced Security"
I have also installed Remmina in the Ubuntu machine. In the server input I have written the Windows machine public IP. "Unable to connect to RDP server 89.130.251.160"
If I ping my Windows7 machine, I have a correct response. Make sure port 3389 is opened on your firewall and router. In Remmina edit your connection, click the "Advanced" tab and choose RDP under the "Security" option and save. Just delete the server causing problem from the file ~/.freerdp/known_hosts and it will work. For me deleting the offending host in ~/.freerdp/known_hosts and changing the Security setting to NLA worked. 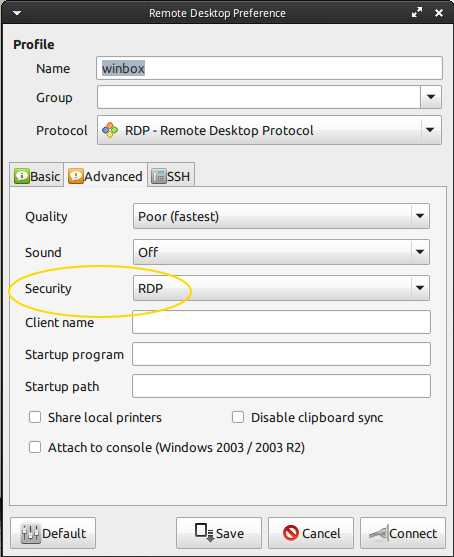 RDP used to work, but does not anymore for the Windows 7 machines I work with. When deleting the host from ~/.freerdp/known_hosts doesn't work, try checking the windows remote desktop settings. 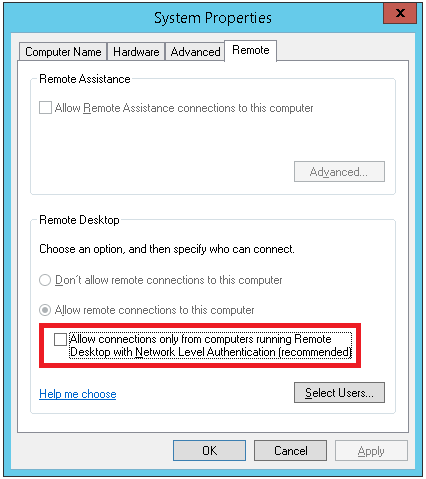 For me disabling "Allow connections only from computers running Remote Desktop with Network Level Authentication (recommended)" did the trick. (search for "allow remote access to your computer" in control panel. I had similar problem when trying to connect a PC running Precise from a laptop running Precise also. Since I had other 2 successful connections one of which was a PC running Windows XP and the other running Lucid. Both used VNC protocol (blue monitors icons) but the one with the problem was set with RDP (flower icon). Just go to the main window of Remina, right-click the connection in question, choose Edit and change protocol to VNC. Hope this will help. I have the same problem. In my case the remote server is wondows2012R2 which was new installed and i connected to it latest when it was windows 2008R2. In each case i try, i got that error message, so suddenly, i didn't change the Advanced -> Security to RDP and stay on Negotate and it take the new server certificate and connect. None of these solutions were actually right for me. But on my machine, the Color Depth setting MUST be set to "True color (32 bpp)" to work. This may be different depending on your Windows settings, but it appears that any other setting will just fail with "Unable to connect" message. All other settings are default, created by the new connection in Remmina. Not the answer you're looking for? Browse other questions tagged 12.04 remote-desktop rdp or ask your own question. Why remmina on Ubuntu refused to connect to Windows 7 (Service Pack 1)? Unable to connect to Remote Desktop ?